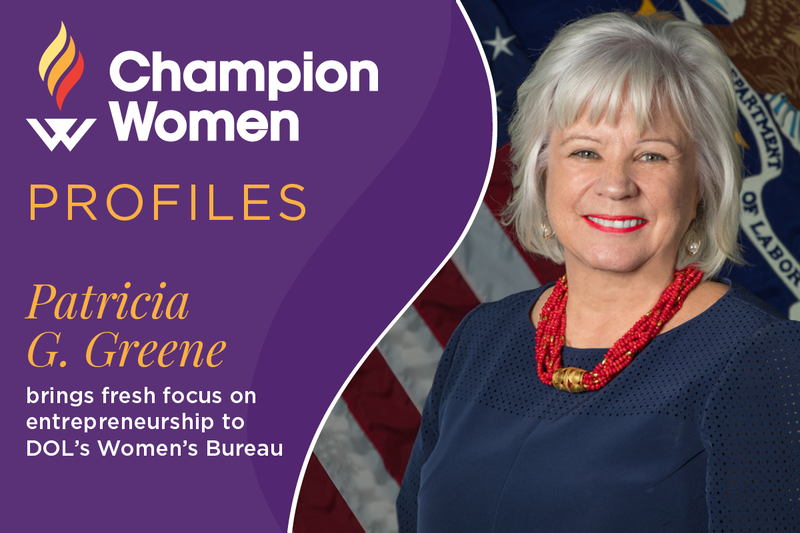 When Patricia Greene was appointed by President Trump to head the 98-year-old Women's Bureau at the U.S. Department of Labor, she brought to the job a fresh focus on entrepreneurship and the tools women need to seize opportunities. If anyone knows what it takes for women to succeed, it's Greene. She is a former professor of entrepreneurship at Babson College, the prestigious business college in Wellesley, Massachusetts, often dubbed the "Entrepreneur's College." Before Babson, Greene taught entrepreneurship at both the University of Missouri-Kansas City and Rutgers University. She is a founding member of the Diana Project, which studies women entrepreneurs, with a particular focus to assessing women's ability to have access to venture capital. This has long been a stumbling block for women-owned enterprise: Women tend to have good ideas and the skills to get a small business off the ground, but sometimes have more difficulty obtaining the resources that are needed to take their businesses to the next level. That's something that can change and in Greene’s new role as the Women’s Bureau Director, she has been charged to use her wealth of knowledge and experience to do just that. In the years prior to Greene’s Presidential Appointment, she was chair of the board of the Center for Women’s Business Research and served as co-chair of the steering committee for the Entrepreneurship Affinity Group of the Association to Advance Collegiate Schools of Business (AACSB), which promotes women's entrepreneurship. Greene's strong work ethic combined with her experience and know-how has provided her with a diverse career path that extends far beyond the classroom, and has helped position her to take on this new leading role on behalf of women. She is a military spouse who built an outstanding career, despite the challenges that come with frequent relocations, which are a feature of life in the armed services. She has also worked many types of jobs ranging – from a waitress to an adviser on women's entrepreneurship for Goldman Sachs. She grew up in the small town of Hamburg, Pennsylvania. "A very small town," she amends in "Pennsylvania Dutch country.” Greene obtained her undergraduate degree from Penn State University in Health Planning and Administration, but she began burnishing her resume early – at the age of 14. "At 14, I asked the local drug store if I could work there. And they actually had to get a special permit for me to start working at that age. But it was great. I worked there through high school and then summers in college. Later in college, I became a waitress at a Pennsylvania Dutch tourist place, and then I worked at a lounge in Stone Harbor, New Jersey." She was an excellent waitress. Those skills – and the tips that came with it – combined with support from her parents, and a part-time job at a Penn State Library, enabled Greene to graduate from Penn State "not owing a cent." Greene was working as a nursing home administrator when she met the active duty Air Force officer she would marry. She married him in Las Vegas, Nevada, but while they were dating he was transferred to Spain. "The challenge for military spouses is probably less about getting a job and more about building careers – and how do you build careers over multiple moves?" The key, she says, is concentrating on skill sets. "I had just started my master’s degree program," she recalls. "I had one course started, and left that and my job, and got married and moved to Spain." She took a few years out of the workforce to raise small children. When her husband was transferred back to the U.S., and again stationed at Nellis Air Force Base in Las Vegas, Greene went back to school and was able to earn an MBA at the University of Nevada, Las Vegas. She was teaching business courses on the base when a mentor suggested that she go for a doctorate. She and her husband decided that it was a good idea and he managed a transfer to Texas, where she could study at the University of Texas in Austin. "On my very first day of my doctoral program, I walked into a sociology class and the professor started talking about entrepreneurship, and I've been hooked ever since. I went up to him right after class and said, 'You have to hire me.'" She once recalled in an interview for the Financial Times that she was warned that concentrating on women's entrepreneurship would be career suicide, a prediction she resoundingly proved false. Greene held the Paul T. Babson Chair in Entrepreneurial Studies at Babson (where she previously had served as Provost and Dean of the Undergraduate School). While at Babson, Greene became the founding academic director for two Goldman Sachs initiatives, 10,000 Small Businesses within the U.S. and 10,000 Women globally. Each helped train small business owners to grow small businesses. "We wrote the program," Greene recalls of the Goldman initiative. "We developed all the training materials. We then worked with community colleges across the country, when they were getting ready to launch their program. We took over the data management, so basically the quality control piece, and worked with Goldman very, very closely to put it all together." In addition to advising Goldman Sachs, Greene has served on the national advisory board for the SBA’s Small Business Development Centers while at Babson. When it came time for President Trump to name a new head of the Women's Bureau at the Department of Labor, Greene's resume made her a natural choice. She was named to the position in October 2017. The Women's Bureau was established in 1920 with the congressional mandate to "to formulate standards and policies which shall promote the welfare of wage-earning women, improve their working conditions, increase their efficiency, and advance their opportunities for profitable, employment." She once recalled in an interview for the Financial Times that she was warned that concentrating on women's entrepreneurship would be career suicide, a prediction she resoundingly proved false. Patricia Greene is the eighteenth director of the Women's Bureau. A lot has changed since the Women's Bureau was created. In 1920, women made up 21 percent of the workforce; today it is 47 percent. "President Trump’s Administration is working to help all Americans access good, family-sustaining jobs. At the Women’s Bureau, we are focused on empowering women to thrive in all aspects of America’s dynamic economy," she wrote on a blog. One of the issues currently in the forefront include access to opportunities, such as apprenticeship, which Greene described as "an earn-while-you-learn career pathway" that "can help women enter careers in which they are historically underrepresented, such as construction, manufacturing, and STEM fields." Last year, Greene delved into one of the most pressing issues for working families—availability to families of quality, affordable childcare. She launched a "listening tour" in 10 U.S. cities, with Senior Adviser to the President, Ivanka Trump, joining Greene for three stops. Ms. Trump once referred to it as "Dr. Greene's nationwide road show to advance high quality and affordable child care." A purpose of the listening tour was to see what creative solutions are being tried in various parts of the country. "We know there are some great home-based center programs or family-based centers where there's a smaller group of children, mixed ages," Greene continues. "There is some interesting research around the benefits of this kind of child care. And there are some interesting business models that are actually creating hubs so that they can do some shared services, both around their business models and around quality assurance – or quality provision. These are the kinds of we are interested in exploring." She is always insistent on bringing another factor into discussions that is near to her heart: early childhood development. "We must think about the future of the labor force as well," she says. Greene delved into one of the most pressing issues for working families—availability to families of quality, affordable childcare. She launched a "listening tour" in 10 U.S. cities, with Senior Adviser to the President, Ivanka Trump, joining Greene for three stops. The tour culminated in a White House session. The White House announced that its Fiscal Year 2020 budget proposal included a one-time investment of $1 billion to increase the supply of child care to underserved populations, and spending $5.3 billion on the Child Care and Development Block Grant program, a significant increase from previous administrations’ proposals. Another priority is helping military spouses launch and sustain careers. Occupational licensing, which disproportionately affects women in the workforce and military spouses. States have stringent and expensive licensure requirements for jobs, such as in cosmetology, that don't transfer to other states. The Department of Labor has advocated for eliminating unnecessary licenses and increased portability to make it easier for military spouses to identify licensing reciprocity. But the best way to promote good jobs and working conditions for women (and men) is a good economy. "I think we do have that kind of economy," says Greene. "We are very focused on opportunities – helping build opportunities and ensuring women have access to those opportunities. Right now the unemployment rate for women is the lowest in more than 65 years – 3.4%. So, there’s lots of opportunities to participate." Participating alone isn't Greene's goal: She wants women to have the opportunities to find lasting career paths, that support them and their families, for the long-term, and to give women the tools they need to make the most of those opportunities, just as she has.